Tommaso Rada ist der letzte Fotograf, den wir euch im Rahmen unseres Portugal Photography Specials vorstellen möchten. Wir haben mit ihm über seine Arbeit an den Serien »The Domestic Borders« und »Born to Fly« gesprochen, in denen er auf eindrückliche Weise die portugiesische Gesellschaft portraitiert. Durch die intensive Auseinandersetzung mit Subkulturen Portugals, wie zum Beispiel in der Serie »Born to Fly«, die sich mit der Brieftaubenzucht als eine der ältesten Zuchttraditionen des Landes beschäftigt, zeigt er seine Fähigkeit feingliedrige Strukturen genau zu beleuchten und macht sie damit anderen Menschen zugänglich. On your website we can see three different series which focus on domestic borders. What fascinates you so much on this theme? When were those photos taken? I am part of a collective of photographers named Colectivo Photo; the projects related with the European Domestic Borders are part of a larger work where all the photographers of the collective are involved. The parts I did were realized between 2014 and 2015 and involve the borders between Portugal and Spain, Romania and Bulgaria and Bulgaria and Greece. In Colectivo Photo we decide to focus on the domestic border as an way to speak about Europe. The domestic borders of Europe, now – after the Schengen Treaty and with the European unification – are gone. Just mountains, rivers and imaginary historical lines, are what have left: a liquid frontier between two apparently distinct countries. 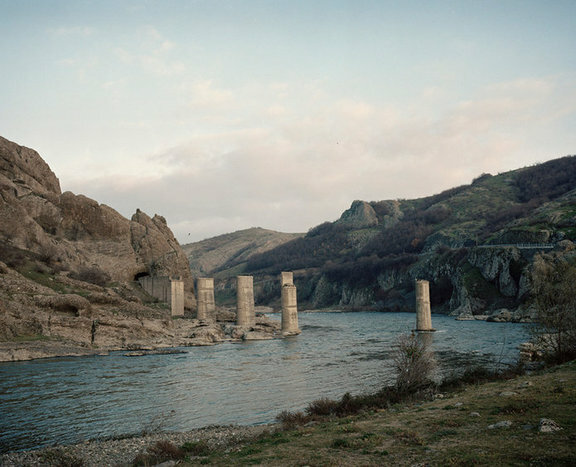 The rivers, the mountains, the history trapped in the places define the communities, the interaction and the contacts between the people of two neighbouring countries, where the territory and the communities shape reciprocally around a specific space – physical, human and cultural – that get dissolved in the same rivers, mountain places that divide them. Empty of its political value, from a strange limbo made of controls and checkpoints the domestic borders become just a line on a map. The emptiness of the frontier, that have should fill of new life and new dynamics after the unification, get reflected in the territory, the time get stopped and while the world around is changing, on the border the space is assuming a proper physiognomy, and the time is sometimes frozen. The Domestic Borders becomes a route where each photos is a stop on the way, not searching for answer but interrogating the social reality, the relations between habitants and the territory and the meaning of Europe today. “The Domestic Borders” ends up being an unusual and unexpected trip, a dystopian portrait of the relationships between and across the border, showing the challenges of living in an unique space with a different passage of time. When is the starting point for such projects, or the reportage “Born to Fly”? Do you investigate a lot? All the stories I decide to follow have a social, economic or cultural issue behind them. Even “Born to Fly” can be seen in this angle; a lot of money is involved in pigeon racing and it is an activity (a sport, a tradition, a business) that involves a very peculiar social environment, very different social classes. I am really fascinated – and sometimes scared – by society, its behaviors and contradictions. When I start thinking of a project, I do a lot of research on the topic, from different points of view. Then, of course, every project has a different execution depending on what has already been done, on my personal view and on the subject and the reality I deal with when I start shooting. What is the story behind the carrier pigeons, what are they used for nowadays? When were those pictures taken? The work on Racing pigeons has been done between 2014 and 2015. Pigeons are the oldest domesticated bird in history. Racing pigeon are mainly used today for sport purposes. In Europe pigeon race is very popular in several countries such as Germany, Belgium, England, Holland and Portugal where the pigeon race sport is second only to soccer in number of participant and followers. Pigeon race is a particular sport that involves all the different social class of society because everybody has the possibility to win. Even if in Europe bet are not officially allowed, there are several European and international contests such as the European and the World championship or the Golden Race in Portugal where the winner cash 75,000 Euro. If pigeon breeding can be simple and relatively cheap but it could be also involve considerable amount of money; Pipa (a Belgium society that organize online auction) some years ago sold to a Chinese buyer a pigeon for around 300,000 Euro and a Portuguese buyers last year bought from Pipa 2 pigeons for 150,000 Euro. On Pipa’s site while it is possible to find pigeons for around 400 Euro very often the prices reach 5,000 Euro. While in some European countries there are not so many young and new breeder that adhere to the sport in other countries like Brazil, South Africa, Turkey, India, Japan, China and Taiwan pigeon racing is becoming increasingly popular possibly because of the incredible bet that is possible to do and the money cash for the winners of the tournaments. Despite the critics relatively to the treatment of the animals in Taiwan a tournament can count even 2-3 millions of birds, 500,000 people participating and the prize money for races reaches the billions of NT Dollar. How would you describe your work as a photographer in Portugal? Do you make your living by commercial work (i.e. advertising) or by selling prints? Contracted art projects or self-initiated ones? I think that nowadays a photographer needs to be dynamic and open-minded; I use to do very different things: commercial works, corporate projects, editorial assignments and prints selling (mostly via Colectivo Photo). The most important to me is to get involved in Projects that can trigger my imagination and therefore represents new creative challenges for a photographer as I am. You are internationally publicised, how do you get your assignments usually? Would you describe yourself as a travel photographer? Some of the publication are assignment that I usually get because along the years I built a relationship of trust with the people I work with, others project published are personal projects, stories I believe are interesting and I decide to follow, in these cases after I complete the reportage I sell the story to newspapers and magazines. I would describe myself as a documentary photographer. I think photography is a powerful and complex medium and in order to tell a story through images, I think you must be aware of your responsibility, of your own gaze and its agency. As a photographer, I like to think that my work can show what is apparently out of sight or, generally, overlooked, and doing that I try to engage with stories that are not mainstream, possibly, “other stories”: small but crucial frames of “big pictures” of the world and its humanity. You have been awarded in 2014 and 2015. Can you show us some of that work? Tommaso Rada is an Italian photographer currently living in the north of Portugal. He attended several workshops taught by Alexandra Boulat and Gary Knight, Franco Pagetti, Jan Grarup. His works has been published in several magazines and newspapers such as Financial Time, Der Spiegel, Monocle, Popoli, Popoli e Missioni, Private online edition, Expresso, Helsingin Sanomat, Courrier International, Le Pelerin, Washington Post and Forbes Brazil. He collaborated with Unicef Mozambique, Comunità di Sant’Egidio and Habitat for Humanity Portugal.